The launch of DePuma’s Gluten Free Pasta was inspired by John’s wife Gina, who has been living with celiac disease and on a gluten intolerant diet for over ten years. With Gina struggling to enjoy quality pasta again, John, a chef by trade, decided to come up with a recipe that would taste and have the same texture of traditional pasta. 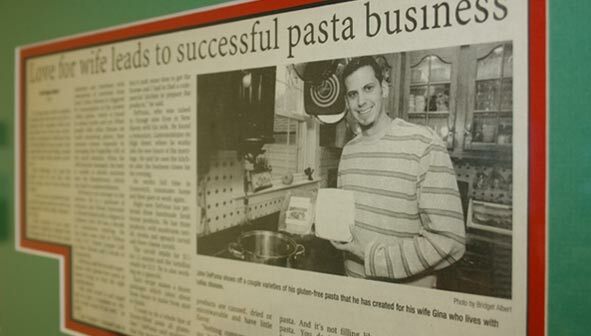 With plenty of trial and error and over a year of perfecting, John has developed a gluten free pasta that Gina and all others with dietary restrictions can enjoy again! John began his career studying Culinary Arts at Johnson & Wales University in Providence, Rhode Island. After Graduation he spent time learning various methods of cooking at Foxwoods Resort & Casino. Then John decided to hone his skills and technique by becoming a Sous Chef at Tribeca Grill in New York City run by famed restauranter Drew Nieporent. After spending three years learning and perfecting his skills in New York, John has returned to Connecticut. He has worked as Sous Chef at Union League Café in New Haven and Chef de Cuisine at L’escale in Greenwich.